Dreaming of a wildlife experience? Come and visit CuriOdyssey. This zoo and museum in Coyote Point Park let you watch and study wildlife species. The place is ideal for kids for wildlife science exploration. The best thing about the CuriOdyssey is that children are given a chance to engage and interact with nature through various activities. While your kids get busy with experiments, they too have time to play at the same time. Why is science helpful to kids? Science involves communication, helping kids develop their patience and determination. Thus, giving them a better understanding of the world and everything around. Let’s learn together the things inside the museum! CuriOdyssey houses more than 100 animals that could not be returned to the wild. Most of them are native. They have species of reptiles, amphibians, mammals, invertebrates and birds. These captive animals are used in school programs and public activities too. Animals have their own lifespan. Some animals in the wild can live for few years but with the captivity, they survive for more than their span. In CuriOdyssey, the Bearded Dragon for example. In the wild, this reptile can live up to 10 years but it has been reported that in captivity, the Bearded Dragon lives up to 15-20 years. You can register your kids for science classes on Fridays and make your preschooler’s a natural scientist. The class is open for children 3-4 years old. The goal of this activity is to enhance children’s instinct of observing, discovering and understanding science. During classes, children play slime and encounter different animals in the zoo using all 5 senses. Museum educators are making sure each child is given an exciting experience in this activity. However, participating kids must be able to use the bathroom independently. You can watch up close the Otter & Bobcat and know stories of the animals during feeding days. You may also witness their animal keepers as they do enrichment activities and training sessions with the animals. Or else, joining the animal walk. This activity is open for 1st-3rd-grade kids who wants to engage in fun-filled educational activities during weekends. The program has 3 sessions with each topic platform. If your child loves outdoor learning activities to explore and investigate, summer camps best suit for him. This activity helps him develop critical thinking skills. Camp themes are specified by age group where they can attend distinctive themes every year. They also offer camping activities to campers with special needs in communication with their parents. There is also a 2-hour workshop on a Saturday. The workshop includes studies of everyday phenomena. An exciting activity to adapt the changing world. The workshop is open for youth age 10-11 years old. Some events at CuriOdyssey are admission free for members. For Cinema nights, tickets are available to purchase. Aside from different fascinating tourist destinations, San Mateo offers a perfect staycation for travelers. Make your stay as comfy and stress-free with these 5 top-rated hotels in San Mateo. 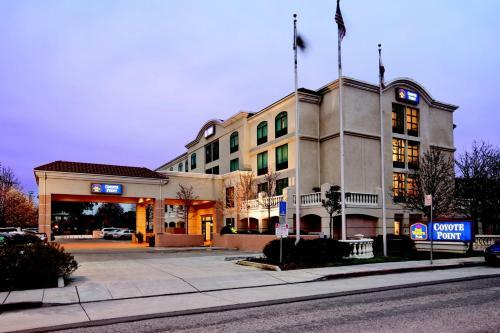 Spend the night with one of the best value hotels in San Mateo. The 3-star suburban hotel, Hilton Garden Inn San Mateo is just 6 miles away from San Francisco Airport, providing easy access to and from the airport with their complimentary shuttle service. If you are that person who loves sightseeing along the bay and shopping, you are at the perfect place to stay. The hotel is just walking distance from the Bridgepoint Plaza, shopping outlets, and restaurants. They serve American classics at the Garden Grill and Bar. The Pavilion pantry is open 24 hours for guests convenience. They also have a business center, outdoor pool, and a fitness center. The Mariner’s Point Driving Range, Silicon Valley, Coyote Point Museum, Hillsdale Shopping Mall are some of the nearest attractions from the hotel where you can start exploring the beauty of San Mateo. Explore and take a time to relax at BEST WESTERN Coyote Point Inn with your family. They have spacious family size non-smoking rooms with disability access. The 3-star hotel is just 9km away from San Francisco Airport. Start your day with a cup of coffee in-room and a hot breakfast buffet. Fitness Gym is available 24 hours. Aside from their comfortable accommodations, their location is a central point of access to everything in San Francisco Bay area. There’s so much you can visit nearby like the Japanese Tea Garden, Giants at AT&T Park, Horseshoe Cove, Coyote Point Museum that is popular for its science exhibits and more. Holiday Inn is just 8 km away from San Francisco Airport offering free shuttle service in between. This family-friendly hotel offers free stay and eat to children age 12 and under with shared parents room. Enjoy food and drink serving American Cuisine at Bistro 330 featuring à la carte meals. Business center and gym are 24 hours open too. For the corporate travelers, this 3-star hotel in San Mateo is perfect. Their business center and internet connection are accessible 24 hours. Planning to host an event? They too have event spaces with over 2, 500 sq ft. Nearby attractions include Coyote Point Museum, San Mateo Municipal Golf Course, and CuriOdyssey. Take a pleasurable trip at San Mateo Marriott, just 10 km away from San Francisco Airport and 11-minute walking distance from the beach. Hourly shuttle service is provided from or to the airport. WiFi and Wired Internet connection is available but costs you $9.95/24hr. Public parking which you may need to reserve is $24/day. Reserved private parking is $30/day. Rooms have pay-per-view movies and HBO channel. They also have business and Fitness center. Car rental is available too. Nearby attractions include CuriOdyssey, Hiller Aviation Museum, and San Mateo County History Museum. This 3-star hotel is good for the family who wants to stay longer in the place. Located 8.6 miles away from the Airport. The hotel might be a bit far from SFO, but you will be impressed with their amenities. Rooms have fully equipped kitchen with ovens, refrigerators, stovetops and microwaves. They also have a fitness center, outdoor pool, and snack bar. Free services include high-speed internet connection, self-parking, and a manager’s reception. This hotel is pet-friendly too.